As Diane watched the early morning bustle of the delivery ships, she lamented the loss of the snow day. Sure, they didn't need it any more with snow shuttles and Thermex clothes, but it was a nice tradition. Plus, she'd had one hot toddy too many last night and hadn't come close to finishing her grading. 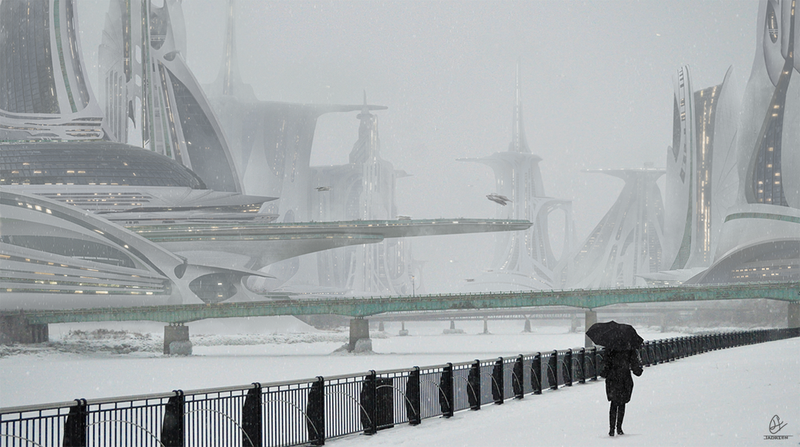 "Sci-fi City" is by concept artist Jadrien Cousens and it's available as a print. He took a photo of the Penobscot river on a snowy day and used that as his starting point, leaving the bridge that spans the river and adding some buildings of his own.